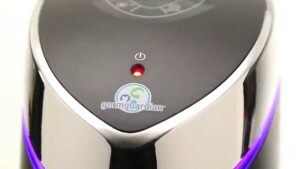 GermGuardian - AC5250PT : Air Purifier Review • The Air Geeks, reviews of air conditioners, dehumidifiers and air purifiers. And here goes GermGuardian again! Are you looking for a strong air purifier for your room? The AC5250PT combines different filtration mechanisms to ensure that your room is free from dust, pet dander, pollen, smoke, allergens, and other airborne pollutants. The AC5250PT offers many impressive features that make it a popular solution for air purification. In case you are interested in this unit, we have researched and gathered all the information that you need to know about it. The information that we have compiled about this unit will help you to determine whether this is the right air purifier for your needs or not. Let’s dive right in! If you are looking for an air purifier that is capable of capturing virtually all the airborne pollutants in your room, then you need to consider this unit. 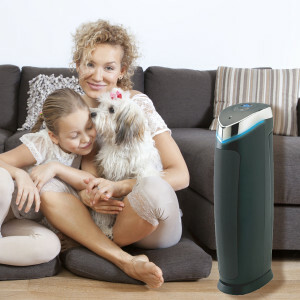 It combines True HEPA filtration with Pet Pure Treatment to ensure that the air that you and your family inhale is clean and fresh. The True HEPA filtration mechanism enables this air cleaner to capture up to 99.97% of airborne pollutants before they get to you nostrils. This mechanism effectively captures different types of airborne pollutants such as pollen, pet dander, dust mites, and allergens. On the other hand, Pet Pure inhibits the growth of odor-causing bacteria, mold, and mildew on the filter. It is a strong antimicrobial agent. This air purifier captures airborne particles that are small as 0.3 microns. The AC5250PT features a charcoal filter that eliminates different household odors. This filter is suitable for reducing bad smell from pets, cooking, and smoking. It ensures that that the air in your room remains fresh at all times. In addition, the AC5250PT utilizes UV-C light technology to eliminate airborne viruses, bacteria, mold spores, and germs. This ensures that you and your family are protected from harmful micro-organisms that could be in the air. What is the size of your room? The AC5250PT is suitable for medium and relatively large rooms. It can be used in large offices, bedrooms, and living rooms. This powerful air cleaner offers 5 speeds and an impressive CADR rating of 125+. In addition, it features an intuitive user interface that allows user to adjust settings with ease. To ensure that the user does not forget to replace a worn out filter, this unit offers a filter change indicator. Like most air purifiers, we have noted that this unit produces an unpleasant chemical smell especially when it is new. This smell reduces and disappears after a couple of days. It is recommended to let the unit run in an open space for a few days before you place it in your bedroom or living room. This will help to ensure that the plastic smell does not dominate the air in your office, living room, or bed room. It is not uncommon for air purifiers to produce noise. From our research, we noted that this unit runs fairly quietly when it is in the lowest setting. However, it produces a loud sound when it is in the highest setting. 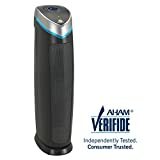 In general, we compared the noise level of this unit with that of other air purifiers of same capacity and observed that it is noisier than most of them. Do you have pets? Then you should definitely check it out! If you are looking for an air purifier that does not consume excess power, then you need to consider the AC5250PT. It consumes a maximum of approximately 63 W and a minimum of around 33 W (when some features are turned off). The unit can therefore run throughout without causing a significant spike in your electricity bill. This is definitely a plus for us at the Air Geeks, one that is overlooked by many buyers! Effective air purification. This unit combines powerful filtration mechanisms that capture airborne particles, allergens, irritants, odors, germs, and other pollutants. Does not consume excess power. From our research, we observed that this unit does not consume excess power. If you want to cut cost and save money, then this is a suitable solution for you. Unpleasant chemical smell. Just like with most air purifiers, we observed that this unit produces an unpleasant smell. Users have run into some problems. From our research, we noted that many units developed problems after running for a few months. This raises questions about the durability of this air purifier. This really does work great! My son has so many allergies & has asthma so I kept looking for something to help him! This was all he needed!! His allergies are almost all gone in his side of our home & he's able to breath a lot better! I'd recommend this air filter system to everyone who truly wants to breath in cleaner air & it kills germs so less sicknesses!! A must buy!!" I got this cause I thought there may be mold in the air in my old old house ( built 1890) since we been here a year in this house there have been no problems but the wife recently started getting hives/ breaking out in rash and what i read was this could kill moldy air and i also thought maybe it could clear up anything else in the air that may be irritating her skin. She has Asthma but never had a problem/ asthma attack so i am sure our dust levels are low, we have 2 dogs that have access to back yard through doggy door so they going in and out ALL day and bringing in dirt, bugs and if its raining.... they got wet dog smell they bring inside. With that said.... our house is vacuumed constantly and cleaned regularly so there really is never a long term bad smell in our house ( or we just used to it hahaha) . So i plugged this thing in downstairs and turned it up to level 5 and turned on the light to kill anything it can that gets cycled through it. As some reviews say there is a smell... my unit had zero initial running smell/ odor about it. I came downstairs and could tell the air was a little fresher but didn't really pay to much attention to it. I Then moved it into our bedroom so it could clean up/ kill anything bad in there we couldn't see, smell, taste, feel etc.. so i turned it on high and closed the door. I returned a couple hours later to get something out of the room and as soon as i walked in I felt the lightest, cleanest , best smelling tasting feeling air ever! So much of a huge noticeable improvement, I told the wife to check it out in case i was over reacting and she was blown away how fresh the air was. If you're looking to clear stale air, odors, dusty air etc.... this will do the job." The AC5250PT combines various filtration mechanisms to ensure that virtually all airborne particles, allergens, odors, and other pollutants are eliminated from the air in your room. This air purifier effectively cleans the air in your room to ensure that your family inhales uncontaminated air. From our research, we observed that this unit produces an unpleasant smell for the first few days. We also noted that this unit has questionable durability. If none of these drawbacks is a big issue to you, then you can proceed and purchase this unit! Recommended.